I first encountered Ancient Bards' first album in a Metalreviews post prior to my becoming a reviewer. I enjoy a number of female-fronted bands and power metal, so with a technically accomplished band, female vocalist, and fantasy power metal, it was a natural choice to try out. It turned into a favorite of mine, and Soulless Child, their sophomore effort, continues where the first left off, with very similar elements. With the bombastic opening of the first song, To The Master Of Darkness, the second installment starts just as powerfully as the first one did. 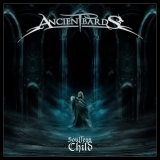 Ancient Bards has been compared by some reviewers to Nightwish, but with the first listen, it's pretty clear that those guys must only have looked at the genre label and guessed. True, they inherit a lot from a popular band, but it's not Nightwish, it's another Italian band -- Rhapsody. Luca Turilli's influence stands out in the virtuoso lead guitar of Claudio Pietronik, the colorful lyrics have no hint of gothic darkness (even when the lyrics are of death and despair), and the galloping drums and bassline has a lot much more in common with Dark Moor than with anything out of Finland. The instruments mix beautifully, without one taking over completely, but also without the mix turning into an over-slick puddle of goo, which power metal can do sometimes. Rather, each member puts in a strong performance while supporting the others, and they stay nicely out of each other's way, considering how much technical ability plays into the performances. Usually the Dungeons & Dragons/Ren-Faire attitude of the music is endearing, but a few times it is just annoying. All the songs are dense with lyrics (really dense, more like listening to opera than to a metal album), the story they tell is like a teenager's Final Fantasy fan fiction -- it's that bad -- and the spoken-word parts, especially, are cringe-worthy. Fortunately, the melodies and overall musicianship more than make up for it, especially on Broken Illusion, All That Is True, and the final track, Hope Dies Last. Great melodies and catchy songwriting redeem lyrical silliness on many worse albums than Soulless Child, and I'm willing to overlook this shortcoming not only because of the well-crafted songs and technical skill, but also the band's best asset, in my opinion: their vocalist's performance. I'm not going to mince words here: I love her voice, and can't get enough of the sound of it. Instead of resorting to opera-style vocals, which one might be able to get away with in this sort of band, Sara Squadrani simply blasts the listener with clean, wide-ranging power metal vocals, and her high notes can send shivers down your spine. Even the weakest songs in the album (Through My Veins didn't impress me much, especially since it felt like it was just put in to move the story along) get a big boost from her singing. It's my opinion that she's probably one of the best female vocalists in the metal scene right now, especially in the clean vocals category. The final track in the "story" left the audience, again, on a cliffhanger, so one hopes we'll see another album out of Ancient Bards soon. Minor annoyances aside, this is a fine album and a strong upward continuation of their first effort.